After all, she said, the hardest part of writing is translating the beautiful abstract story from your head into words on the page. Nothing can help you get faster except lots and lots of practice. Completing a whole story arc over and over, which short stories allow you to do, helps you get faster at the translation part. She and two of her author friends committed to doing one story a week each, and they found the practice really helpful. You can read some results and about the process in The Curiosities. Having just rewritten a 1,500-word story at least five times in seven days, I can confirm that translation is hard. For me, I had trouble even figuring out what I meant to say, but that might just be another way of saying “translating the feeling and impression in my head onto words is hard.” I did at least write the end first, advice I got from Jonathan Maberry (who credits it to someone I’ve forgotten), but then I changed the ending. I find that my prose “sets up” (like concrete) a lot faster in a short story. Writing longhand first would help me be less precious about the words. Because I was writing for a contest with a low-ish word count limit, I kept worrying about that. Do not do this. Instead, get everything down first and then trimming and eliminating. I hope Future Me will remember this. Another technique Maggie suggested was the “blind rewrite,” or I might call it the “fresh start rewrite.” After you’ve analyzed your story and figured out what’s wrong, start with a completely blank page and rewrite from scratch. It’s doesn’t take me more than 90 minutes to write 1,500 words if I’m not too focused on getting the “right” words down. I found myself longing for clever turns of phrase from the previous draft, but you can always go back and grab them. I found that sometimes I had come up with even cleverer ways to phrase things by remembering only the impression that I had. As I got to later revisions, I only wrote the new snippets from scratch, but I did them before diving back into the existing prose. That kept me from being too in love with old words to truly write the new words I wanted. Maggie says the most interesting bits of writing are the points of greatest contrast. Even/especially for novels, she likes to think up the pivotal moment and work backwards, to make sure the reader has been properly set up for it. The beauty and difficulty of a short story is that you don’t have much room to fit in a whole character arc, but it can be done! Some short stories are more like tone poems, but if you can build to a dramatic crescendo, why not? The down side is that I spent 7 workdays on this short story instead of working on my novel. Now, I need the practice, I like the result even if it doesn’t win the contest, and it’s good to get away from my novel once in a while. But I do hope that the practice helps me get faster, because I spent an average of like 40 seconds per word on this thing. Last month, the second anniversary of my transition to being a full-time writer passed without my noticing. Maybe the second anniversary is never as exciting as the first, but I also have an excuse: I was finishing my book! I told myself I would finish in April. Then in May. Then in July or August. But I know the difference between a real deadline and a fake one, so I knew I had to create consequences. I decided that if I got to September and still hadn’t finished, I would cancel all my social engagements until I did! Unfortunately, I didn’t clarify to myself. What about weekends, when I have to come up with ways to entertain the kids? What about parties I’d already agreed to host or attend? It wasn’t a clear enough consequence. BUT. I finished! This is version 4.5 since September 2016, when I sat down with a new abundance of time and nothing but an outline. Version 1 was in third person POV and reused a character from an older version as the love interest. Then in January of 2017, I fell out of love with him. For version 2, I chucked about 30,000 words and the love interest, scrambling to finish by the end of April (and the real deadline of my editor). In version 3, I switched to first person POV (on said editor’s advice). Version 4 rejiggered all the relationships, took some great feedback from several more amazing editors, ruthlessly chopped 9,000 words (and so many darlings) from the first half, and added 6,000 words to flesh out the end. Now… on to the query trenches. Author Kimmery Martin asked to see word counts in corkboard view for Scrivener. While I’m not positive this is what she wanted, it sounded like a helpful feature, so I tried to figure out a way to do it. First, I’ll show you how I do it. I have my scenes and chapters organized in the Binder and I click to different levels to see the word count at the bottom of the main editor window, which is in “Scrivenings” view (i.e., viewing the text). I can adapt that same strategy to see word counts in corkboard mode. First, create a vertical split view by using the buttons in the upper right corner of the editor. Set the center editor to corkboard view, then click on the button to sync the two editor panes. 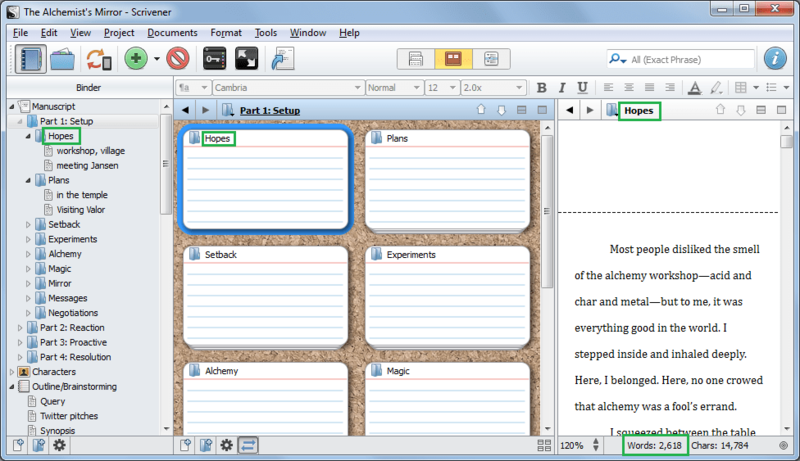 Set the right-hand editor to text/Scrivenings view. The problem is that drilling down to see the scene-level word count isn’t easy. If what you want is to see metadata (label, synopsis, status, etc. ), then outline view might be what you want for the middle section (which also lets you move more seamlessly between scene and chapter (updating the right-hand editor and word count as you go). At the beginning of this year, I set for myself what I considered to be ambitious but achievable goals: accumulate 75 rejections and edit my second book. Of course, I wasn’t really after 75 rejections; I was hoping that I could find an agent who wanted my book before I hit that number. But querying 75 times was something I could control, so that was the official goal. What I got was a lot of confusion and a very gentle, “You’re not quite there yet.” Oooof. Reality bites. And yet, better to find out that way than by getting 75 rejections, right? Since an author can usually query an agent only once per story, I didn’t want to waste opportunities if the story wasn’t ready. Fortunately, I also got some really good suggestions from a knowledgeable friend, who read my story not once but twice! With a little reluctance (how much longer is this process going to take?? ), but also a lot of motivation (I will work until I succeed!) and some direction, I embarked on yet another edit. I followed Susan Dennard’s amazing revision process, and spent way more time brainstorming than I had hoped to. I reconsidered nearly every aspect of the story, all the way from scratch, and landed not too far away from where I started. Finishing the edits again took way longer than I wanted—I had hoped to be done by the end of March, and it was almost the end of April—but I was still able to submit to RevPit, an online mentorship contest run by a group of freelance editors. Though I wasn’t selected as a winner, I got unbelievably encouraging feedback from one of the editors. It was so incredibly validating (yes, I’m using all the adverbs today) to see that my deep, deep edits had indeed made the book better—even good enough that someone could be excited about it! Of course, the feedback, while good, still means that I have another round of editing to do before I will really want to query this story. But I’m almost as happy as if I’d won the contest. When I’m editing by yourself day after day, I get to the point where I can’t tell anymore if I’m actually improving the story. Now I know that my efforts were indeed helping, and I’ll have a clear direction for where to go from here. Hopefully, making the story even better will mean I won’t have to go through 75 agents before I sign one. But if I do, at least I still have the second book that I’m anxious to get back to! I can’t remember when I didn’t want to be an author. I wrote my first story in Kindergarten, and I still have it (thanks, Mom!). It was about a princess, a dragon, and a knight, so… not much has changed. My favorite Doctor is Ten (with Rose Tyler, as it should be—FIGHT ME), but Nine was my first, and you never forget your first Doctor. I love ballroom dancing (that’s how I met my husband! See pic at right). I have two boys. The oldest just started Kindergarten and the youngest just finished potty training (cue the choir of angels!). I carry teabags in my purse because you never know when you might want good tea, like airplanes that carry only Lipton, fancy dinners that don’t have decaffeinated black tea for drinking with dessert—you know, the usual. My writing ritual requires tea and I drink unhealthy quantities of it. If I could be anywhere right now, it would be on a tropical beach with a drink that has a little umbrella in it. Chocolate is life and you can’t persuade me otherwise. I’ve now trained myself to like dark chocolate, and the best chocolate bar I’ve ever tasted is Divine Chocolate Hazelnut Truffle. If you bribe me with that I will do almost anything for you. I’m a Ravenpuff. When asked whether I’d rather be right or kind, the former wins but the latter is what I try to do. 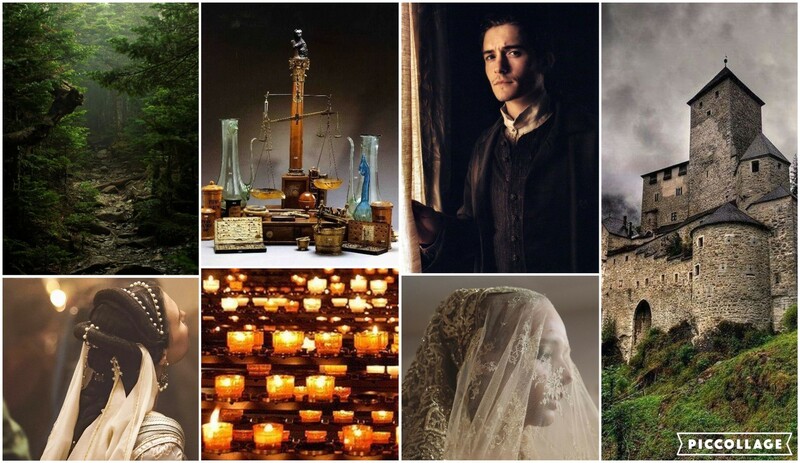 An ugly alchemist makes a magic mirror, only to discover that beauty doesn’t fix her problems and magic always has a price. In the tradition of Wicked and The Forbidden Wish, my YA fantasy novel The Alchemist’s Mirror brings to life the backstory of Snow White’s stepmother in a 14th century that never was. I last participated in NaNoWriMo in 2010. Since then, I’ve had two kids, quit my job, and rewritten my novel twice. Along the way, I picked up quite a bit about story structure and am now a reformed pantser (although no one is ever only a plotter or a pantser, many lean far to one side of the spectrum or the other). Given my love of plotting, then, I didn’t know if I’d ever participate in Nano again. However, I was sufficiently motivated this year, and I’m loving it! And what I love most is how the years of studying story structure are paying dividends in a decidedly write-by-the-seat-of-your-pants month. Before I learned structure, when I got stuck, I’d ask myself, “What do I want to happen next?” Or maybe even, “What should happen next?” But since I didn’t know anything about that should, I just brainstormed until I came up with a good idea (or any idea). Now, when I want to know what should happen next, I just have to position myself within the framework of structure. “What should happen next? Well, I’ve just passed the call to adventure/inciting event, so now I need to work toward a First Plot Point that will change everything, oh yeah, and reveal the antagonist’s power and/or plan, and force my main character to make a decision to enter the Adventure World.” (Sometimes I even write sentences exactly like that in my brainstorming! Because it’s hard to hold everything there is to know about the First Plot Point in my head all at once.) That is a much easier question to brainstorm an answer for, because structure gives me criteria—a way to judge how good ideas are. Usually by the time I hit on an idea that meets all those criteria, it’s plenty good enough to roll with! It might take slightly longer to get to that idea than to come up with an answer to my old, more generic questions, but the difference is that I know the specific question will lead me to an answer that won’t paint me into a corner and will leave me with something more novel-shaped at the end. That saves me time both in November and in my future edits! I cannot recommend K.M. Weiland’s site highly enough. She will kindly and gently lure you into plotting (even if you still like to pants the heck out of the first draft and just apply structure in editing). For a quick rundown (with way more depth available), check out her everything checklist! P.S. You can support girls’ education and motivate me to finish Nanowrimo this year by donating to the Malala Fund! Happy November, everyone! For writers, the day after Halloween brings not just a candy hangover but the beginning of National Novel Writing Month, or NaNoWriMo for short. Those who sign up attempt to write a whole novel during the month of November. (The target of 50,000 words is technically a little shorter than most novels, but still a lofty goal for 30 days.) “Wrimos” who participate in “Nano” get pep talks from published authors, organize community “write-ins” where authors gather to motivate (and sometimes distract) one another, and provide plenty of accountability and camaraderie to keep going to the finish line. I wasn’t planning to join this year, but then author Susan Dennard announced The Mighty Pens, a team of writers who want to use their words for good. That got me thinking. My book is in a slower editing/querying phase, plus I’ve never tried working on multiple projects at once, a skill that I’ll need if I make a career out of this writing thing. “Just to see,” I started to brainstorm an idea that’s been percolating in my head since May, and that multiplied into many ideas that seem almost novel-shaped. So I decided to throw my hat into the ring! (more like the three-ring circus…) We’re raising money for the Malala Fund to support girls’ education. You sponsor me, I get motivated to keep going, the Mighty Pens authors (including me) qualify to to win prizes, the and the Malala Fund helps girls all over the world get the education they need to secure a better future. It’s win-win-win-win! Winning all around! OK, I don’t know that my writing qualifies as dangerous, but it has been a year since I started this crazy experiment of being a full-time author. It’s been a while since I did a retrospective, so now seems like a good time! When I quit my day job, my counselor warned me that for every year that I was in the old job, it could take a month to adjust to a new routine. Since I was in my old job for twelve years, that means I needed to give myself permission to take up to a year to get into a new groove. I’m happy to report that I have a pretty good groove going now, a year later. Of course, my routine has to be flexible because what I’m writing and the life around my writing is always changing (first kid started elementary school! ), but overall I’m more confident now that I’ll get everything done if I stick to my plan. My addiction to tea has not diminished. The opposite, actually. Ergonomics are really important. Ignore at your peril. Back spasms and stiff necks will hamper my productivity. Rituals and routines are more important than I realized. As it turns out, it’s well-documented that creative people benefit greatly from habitual triggers that put them into the creative mood (e.g., a specific kind of pen or notebook; a specific playlist; a specific place to sit; or a ritual like starting with a hot cup of tea). At first, I did it subconsciously, but now I try to do it intentionally. I can’t actually write for eight hours a day. Besides the obvious necessary breaks, the concentration required to focus on my own writing is too intense to sustain all day; generally, I get only about four hours of really productive writing time. The good news is that knowing that helps me stress out less, because I can remind myself that if I don’t write a lot in the morning, I can still have a good afternoon, and conversely, if I do have a good morning, I shouldn’t feel bad when I run out of steam mid-afternoon. There’s still plenty I can do in my writing time besides writing: read work from critique partners; read published books; cultivate my social media presence (got to be careful not to let that become a black hole, though…); and take care of my physical and mental health (yoga, counseling, etc.). It’s surprising how hard it is to remember that those are furthering my career. That said, I am very deadline-motivated if it’s a real deadline. I can and will make a heroic effort to meet a deadline, including working way more than 8 hours a day, though I’ll need some recovery afterward to catch up with everything else. Fortunately, publishing has a lot of “hurry up and wait.” But it’s useful to know that about myself for the future! Here’s the usual expected formatting: http://marycmoore.com/index.php/2016/01/09/how-to-format-your-fiction-submission/. But how do you get Word to do that? I have Office 2016 on Windows 7, so your setup might look a little different. Try searching the term I give you and the version of Word that you have (e.g., “font dialog Office 2011 for Mac”) if you can’t figure it out, or hit me up on Twitter and I’ll do my best to help. There are two places you might have to set a font. One is the “Normal” style (more on Styles later, but here’s an overview) and one is the “default” font (which is sometimes different). When I was compiling from Scrivener, I noticed that I had to update the default font, but usually updating “Normal” is enough. Almost always, agents and editors want Times New Roman. In my mind, there are plenty of other highly readable, more interesting fonts (yep, I’m a font nerd), but there are good reasons for wanting everyone’s submissions to look the same, which I won’t elaborate on here. If your manuscript pretty much looks right, you can probably skip the font step. Try this first. Go to the Home tab on the Ribbon or bring up the Styles pane (Format > Styles or ALT+o+s). Right-click on the style in the Ribbon or click on the dropdown in the style pane and choose “Modify…”. Set the font and size. In the lower-left corner, choose “Format > Paragraph”. Set the indent and spacing. If this method doesn’t seem to work, try selecting your whole manuscript and clicking on the Normal style to apply it. NOTE! Doing this will get rid of any other styles you’ve applied (e.g., for chapter headings), so only do it if you know you haven’t inentionally applied styles yet. If you already have your words with the proper font, size, indenting and spacing, you can just update the style so that it becomes the default. This step should only be necessary if you’ve done the above but parts of your manuscript still look fishy. Open the Font dialog. It’s under Format > Font, or in Windows you can type ALT+o+f, or you can open it from the Ribbon (outlined in red below). Choose Times New Roman, 12 pt, and then click the Set As Default button in the lower left. For the first page that Mary C. Moore recommends above, you can apply the “No Spacing” style to change it from double- to single-spaced. If it’s acquired the half-inch first-line indent, you can either backspace once at the beginning of each line, or open the Paragraph dialog (Format > Paragraph or ATL+o+p). Then change “Special” indentation to “(none)”. I usually set the page numbers first, because that’s really easy in Office 2016 (TBH, I can’t remember if it was this easy in earlier versions). Instructions for Mac here. First, double-click in the margin of the page to go to Header/Footer view. This should automatically open the Header & Footer Tools tab group and the Design tab. Choose Page Number > Top of Page > “Plain Number 3” to get right-aligned page numbers. You can also get there from the Insert tab or Insert menu as described here. Then click next to the page number and type your name and title. Note that the number will look grey when you select it because it’s a field that updates, whereas the text you type will be the same on each page. Ours wasn’t quite this upscale, but you get the idea! A low-distraction location. My author friend and I rented an AirBnB with two bedrooms, two bathrooms, a kitchen, and a living room—perfect for us, because it was exactly what we needed and no more. Bonus: it was decorated with tons and tons of books. Of course, the Internet is still a distraction, but that’s true anywhere. Comfy furniture. Ergonomic furniture is nice, but hard to transport, so comfy for the laptops is the next best thing. Caffeine. Lots of caffeine. And herbal tea for the evenings. Music. My friend has a Sonos speaker which we both hooked up to and it was playing basically anytime we were there and awake. It was really convenient that we could each control the music and the volume, based on whoever had a preference. (Let’s be honest, that was usually me.) She also had headphones in case we wanted different moods at the same time. A goal. She had a goal of “write as many words as possible” (she already had a scene-by-scene outline ready). I had just gotten edits back from a freelance editor and I wanted to “make progress,” but I would’ve been less distractable if I’d had a more specific goal. Also it turns out that editing is just time-consuming. Maggie Stiefvater, if you can! We organized the retreat around a workshop she was giving with Court Stevens, which turned out to be amazing in itself, but also gave us an excuse to meet other writers (who already liked the presenters, so we automatically had something in common). Let me assure you that Maggie and Court are just as fantastic in person as they are on Twitter.